The strategy involves the use of covered call writing, leveraged ETFs, weekly options and protective puts. Let’s first define the latter three terms. Leveraged ETFs: Exchange-traded funds that use financial derivatives (like options) and debt to magnify the returns of an underlying index. Protective puts: A put option purchased for a stock already owned by the put buyer. It protects against a decrease in share price and ensures a minimum sale price of the stock. TNA: This leveraged ETF seeks a return that is 300% the return of its benchmark index (small cap bull fund) for a single day. The fund should not be expected to provide three times the return of the benchmark’s cumulative return for periods greater than a day. By nature, these securities are highly volatile and generate higher option premiums. 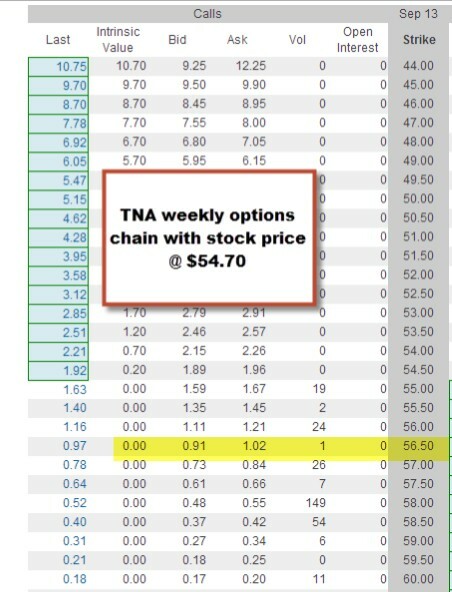 TNA has traded in a $9 price range ($52 to $61) in the past month and so the expectation of assignment during that 26-week time frame is highly probable. To avoid assignment we can buy back the option but that is a debit not accounted for in the original trade proposal. If we allow assignment we would have to repurchase the security at a higher price also incurring an additional, unaccounted for debit. For 26 consecutive weeks you will never be assigned on the short call. Herein lies the weakness of the strategy. We are dealing with a highly volatile, leveraged security which will generate high option returns but also put us at assignment risk. We are protected to the downside because of the put purchase but vulnerable to the upside. Traditional covered call writing can be altered through the use of additional strategies like put buying and other option products like weekly options and leveraged ETFs. These strategies will have their advantages and disadvantages which must be fully understood before implementing them into your portfolios and risking your hard-earned money. Once all aspects of the multi-level strategy is understood, only you can determine if it’s right for you. The one rule of thumb you can always take to the bank is that there is no free lunch. For the week, the S&P 500 declined by 0.1%, for a year-to-date return of 21%, including dividends. BCI: This site remains moderately bullish on our economy but concerned about the ineptitude of our Congress. Therefore, we are taking a defensive posture and selling an equal number of in-the-money and out-of-the-money strikes. The Weekly Report for 10-04-13 has been uploaded to the Premium Member website and is available for download. Thanks for discussing my strategy. You are right with the upside vulnerability, so I got a new idea. Now I add an out of the money call to the weekly trade, so if TNA increase in price I participate also to he upside. Of course the purchase of the call must be less than the premium I got selling the TNA call. If TNA goes south I can buy the covered call back and sell a new generating more premium, getting back the money I spent to acquire the out of the money call. 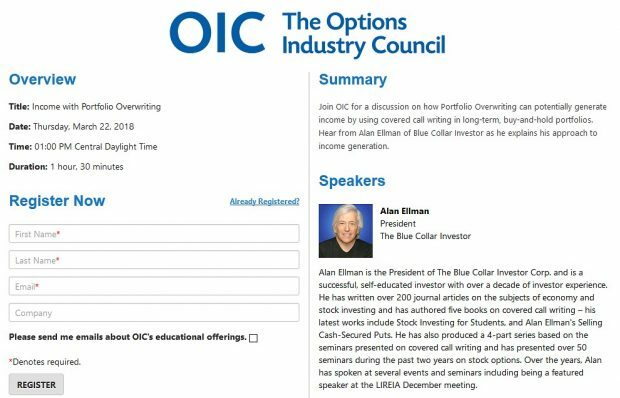 Alan, I got some questions they’re a bit late, but about the weekly options which sound quite lucrative, if I do ever feel good enough to use them. – First if I decided to use weekly options then do all your exit strategies apply to these one week contracts too? – If the exit strategies do apply, then how would I then use the 20% /10% rule in this case? – If there is more monitoring needed(which I presume there is), then should I need an alert system for this? – Also what type of chart or charts should I use for viewing? Stay tuned for more information on weeklys. The trend is definitely for more and more stocks and ETFs with weeklys as the public is demanding these products. There has also been the introduction of “minis” for more expensive stocks like GOOG and AMZN where there are 10 instead of 100 underlying securities per contract. Stay tuned. Thanks for publishing such a wonderful content on your website. On the upside, if the stock gets assigned. Buy TNA stock again and continue the strategy..
Won’t it work..I think it will work the way you described even after assignment or early assignment. “To avoid assignment we can buy back the option but that is a debit not accounted for in the original trade proposal. If we allow assignment we would have to repurchase the security at a higher price also incurring an additional, unaccounted for debit”. ← After Hours (AHT)and Pre-Market Trading: Is It Right for Average Retail Investors?